For anyone who has dreamed of running away to Europe and starting their own winery take heed, as this wine book may just be the inspiration that sets those plans in motion. A Vineyard in Tuscany serves as the memoirs of Ferenc Mate (novelist, photographer, sailing enthusiast, and now wine-maker) and his family as they settle in Tuscany and pursue their dreams of running a world-class winery. With warm prose and beautifully captured detail; the reader is immersed in the warm Tuscan sun, befriends its people, and partakes of the bountiful food and wine. However, it is not always la dolce vita for Mate who discovers building a winery truly is a labor of love. As he turns a 13th century friary into a livable space for his family, clears 13 acres of land for planting, and then plants thousands vines by hand even the most ardent dreamer will be forced to face the reality of how difficult starting a winery is. In the end though this fairy tale has a happy ending as Mate, based on hard work and some excellent advice from his new neighbor Anjelo Gaia, develops truly excellent wines that garner Wine Spectator points in the 90’s. Thus, a dream comes true and readers are inspired to pursue their own crazy ideas. 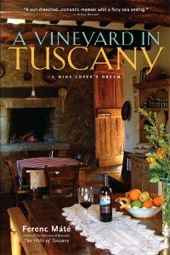 A recommended wine book for anyone with an affinity for Tuscany or with a dream of one day following in the Mate’s footsteps.